Woodworkers tend to favor working with specific hardwoods much like auto mechanics tend to prefer working on specific brands or models of cars. It's often a matter of familiarity and comfort, as the woodworker has had good results with a specific wood so they may be inclined to avoid trying different hardwood species. Every hardwood has its tendencies, or maybe more appropriately for the craftsman, techniques for working with that particular hardwood. This can be especially true when it comes to finishing the piece. For instance, maple can be temperamental to finish and is susceptible to shrinkage due to expansion and contraction due to seasonal humidity fluctuations. Oak can dull tools quickly and can split or tear when routing and can burn easily if you don't move the wood past the cutting tool quickly. Additionally, the look of the finished oak piece is highly dependent on how the wood was milled when the tree was cut (quarter-sawn oak as compared with flat-sawn oak). Cherry requires a finesse touch rather than brute force to manipulate the wood into the desired product, plus getting uniform color across a number of different boards can be challenging. Poplar works great for general woodworking tasks, and is perfect for painted projects, but doesn't take a stain well. And exotic hardwoods like ipe can cause respiratory issues if the sawdust is inhaled. Additionally, some consider it to be a rainforest species that should be avoided. 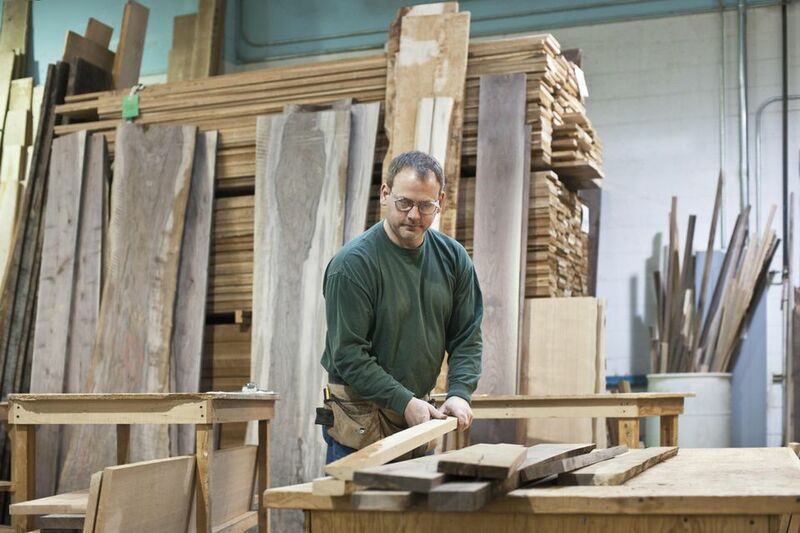 The two most prominent types of walnut available for woodworking are English Walnut and Black Walnut. Despite the name, the English variety is most often harvested from areas of California. This type of walnut is a bit lighter in color than Black Walnut, which is extremely durable, making it ideal for use in furniture pieces that may take a beating. For instance, Walnut was the wood of choice for gun manufacturer Smith and Wesson for their rifle, shotgun and pistol stocks. The lower trunks of black walnut trees are often large and with a great deal of character, making cross sections of this portion of the tree perfect for burls. These burl sections are highly sought after by woodworkers who like to make tables, chairs and other specialty pieces of furniture out of the unusual organic shapes. In spite of the sturdy nature of the finished product, walnut is somewhat unusual for a stout hardwood in that it reacts well to steam bending. Additionally, it takes glue rather well, but glue run-out should be cleaned immediately because if the glue is allowed to dry, it will show through the final finish as a dark, almost coffee-colored blemish within the stained finish. Walnut has a reputation for being temperamental to finish, which is to say that to achieve long-lasting finish will require a little more work than simply applying a stain and polyurethane. Many older walnut pieces that were originally finished with linseed oil or tung oil tend to have a grayish pallor which many people find unappealing. Walnut can have some amazing grain patterns that, while quite dark, can be extremely attractive when finished properly. The first step to showing off these grain patterns is to sand the wood properly. Hand sanding with the grain is the best way to massage this hardwood into bringing out its beautiful grain, working with progressively finer grits of sandpaper as you go. Ideally, you'll want to vacuum or blow out the sawdust from any pores in the wood (with an air hose connected to an air compressor) before proceeding to the next finer grit of paper. After sanding with very fine sandpaper (320-grit or higher) and blowing or vacuuming the sawdust, raise the grain of the walnut slightly by wiping the surface of the board with a damp cloth. Allow the wood to sit for a few minutes, then lightly sand the surface to knock down the raised grain. Shellac is a common first step to finishing walnut, as it can provide a nice base from which to apply later steps such as a gel stain or glaze. Shellac can also be mixed with colorants to lighten the dark walnut. Apply an even coat of shellac and allow it to dry thoroughly for a few hours before lightly hand sanding (always with the grain) using extremely fine sandpaper to knock down any high spots. Vacuum or blow off the residue from the sanding before applying another coat or a gel stain. Many woodworkers like to apply a grain filler to raise the grain, which would be best done after a couple of coats of shellac. After wiping off the excess filler or stain, additional coats of shellac or even mineral oil can bring a nice shine to the piece.